This Model is the next-to-smallest of the hand-inking Model presses (the smallest has a chase size of 2 1/4″ x 3 1/4″). As with all hand-inking presses, ink must be spread on the ink disc and rolled onto the type with a brayer. 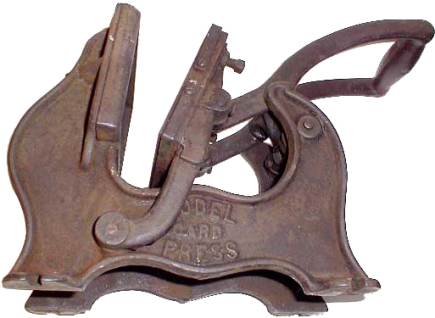 The press shown is missing the ink plate that is normally inserted in back and above the chase as seen on the Excelsior Model 1, a hand-inking press made by the Kelsey Company, and not related to the above press.